Vietnamese food is part of my childhood memories of family gatherings at my Aunty’s. Growing up my diet was mainly mediteranean but from time to time, we would have nems. That was a special treat that we all love as children and we still enjoy them as much today with competitions still going on with who is going to eat the most! I do pretty well, but the boys are good at this! 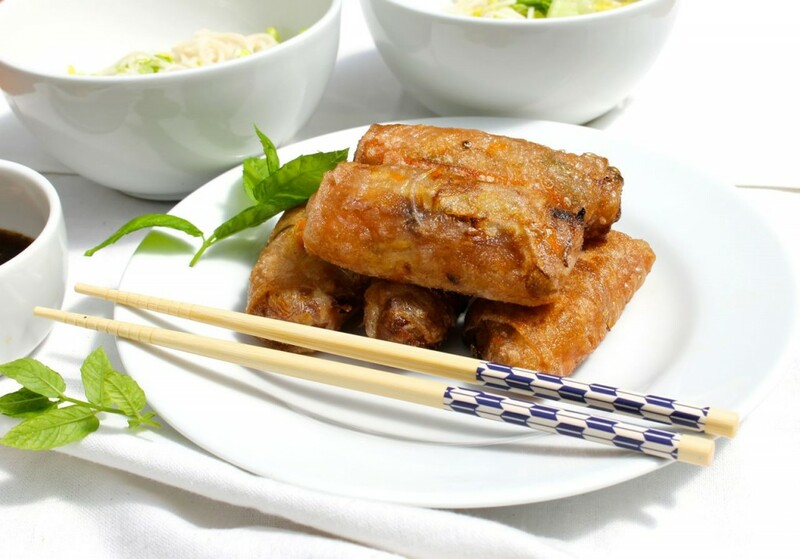 Traditionally, nems are made with pork but they are easy to veganize and work just as well. You need to use a good amount of filling per nem and roll them fairly tight but not too tight or they might burst when cooking. It’ s not a major issue if it does though. 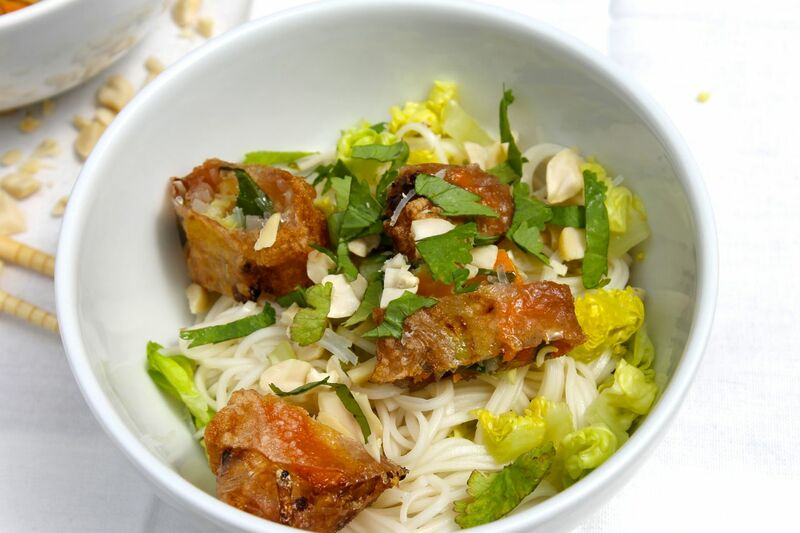 You can either eat nems wrapped in a lettuce leaf or enjoy them as part of a salad bowl. The latter is my favourite way, just add some shredded lettuce, crushed peanuts, noodles, mint leaves and sauce. Nems being shallow fried, there are not the healthiest of option, which is another reason why it’s nice to enjoy them in a salad (ie you eat less nems!). 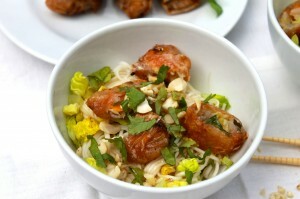 But as an occasional meal, they are really great and a family favourite. The healthy and still delicious option is to make fresh spring rolls. They are great for lunch and ideal for a picnic or in a lunchbox to enjoy at work. The ingredients are mainly the same just add a couple of raw veggies and a few nuts. No cooking required, so even easier. Eat them with a spicy dipping sauce and it’s heavenly. Rolling the nems take a little practise but it’s quite easy. Don’t worry if they don’t look all the same, mine never do but they are still delicious. In a bowl, cover the shitake mushrooms and glass noodles with boiling water and let it sit for 5 minutes or until soft. In a separate bowl, mix all the prepared veggies ( chinese leaf, bean sprouts, collard green, shallots, carrot) and add 1/2 a tablespoon of soy sauce. When the mushrooms and glass noodles are ready, drain and chop them. Add to the veggies. 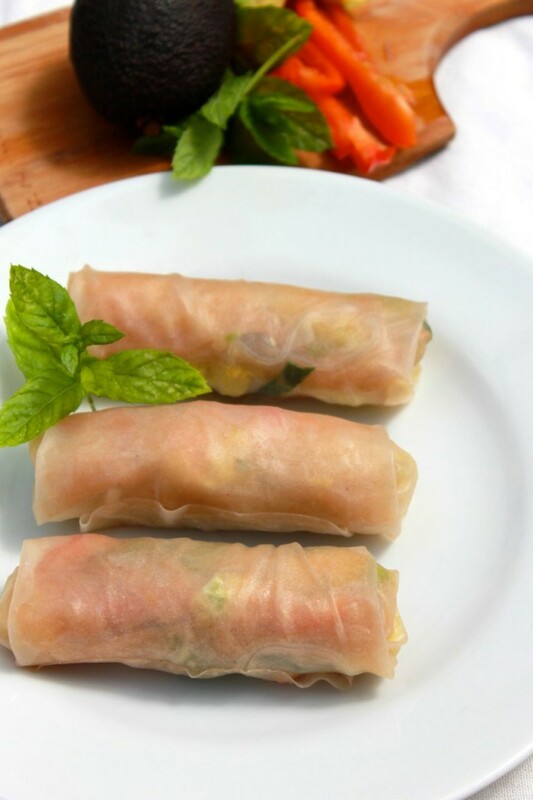 To roll the nems, you will need a clean tea towel and a large dish where you can dip the rice paper. Pour boiling water in your dish. Add a teaspoon of sugar (helps caramelised the nems when cooking). Dip one rice paper at a time for a few seconds, until soft. Carefully move the rice paper to your tea towel (lie it flat in front of you) to absorb some of the water. Fold the bottom of the rice paper (about 1/8) on itself. This is where the filling will go. Spoon a good amount of the veggie/glass noodles mixture on the rice paper. I find it best to have too much rather than not enough. Fold the side of the rice paper over the filing and roll tightly. Place on a plate and cover with a damp tea towel while you keep rolling the remaining nems. You can either shallow fry the nems straight away until golden brown or keep them in the fridge covered with a damp tea towel until for 24 hours. You can also freeze them at this point. Nems require about 5-7 minutes on each side, cooking a medium heat. While the nems are cooking, prepare the sauce. Mix 2 tablespoons light soy sauce with 4 tablespoons water and the juice of half a lemon. Add 2 teaspoons sugar and mix. Taste and more sugar or soy sauce if necessary. To assemble your salad, put some cooked noodles, chopped lettuce, cucumber and a couple of chopped nems. Drizzle some sauce over and sprinkle crushed peanuts, mint and coriander leaves. Cover the glass noodles with boiling water and let sit for 5 minutes or until soft. Process as per the Nems salad recipe to roll. For the filing, place 1 strip of red pepper, carrot and cucumber, a few bean sprouts and some glass noodles. Top with 1 slice of avocado, a couple of mint leaves and some crushed peanuts. Fold rice paper sides over the filing and roll tightly. To make the sauce, combine the almond butter, soy sauce, rice vinegar, maple syrup with a squeeze of lemon juice. Add the chopped chilli and enough water to achieve a sauce consistency. Wrap the spring rolls in a lettuce leave and dip into the sauce. This entry was posted in Recipes, Salads, Vegan.